Published on October 9, 2014 by Martyn. Be the first to comment! 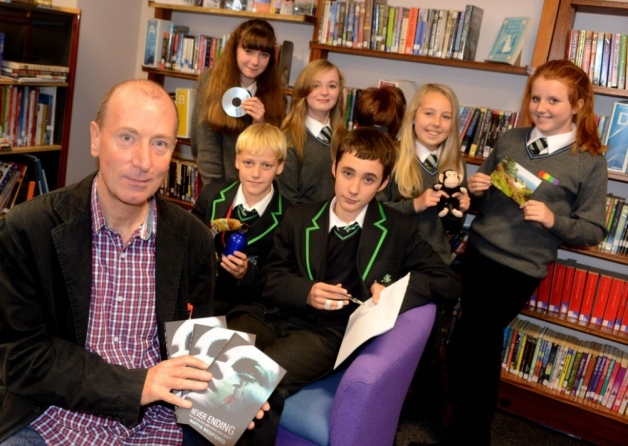 Here I am with some of the students who attended my creative writing workshop at The Morley Academy earlier this week. Ten young people from the host school were joined by ten from the BBG Academy in Birkenshaw in an event which formed part of this year’s Morley Literature Festival. In case you’re wondering, one of the boys in the front row is NOT wearing his hair in a beehive . . . the girl behind him is holding up a wig, one of the props I used in the workshop! The students who took part in the session, all in Year 9, were brilliantly enthusiastic – a real credit to their schools – and produced a range of highly imaginative pieces of writing. I’m grateful to the librarians Kristy Rabbitt, from The Morley Academy, and Karen McKirgan, from BBG, for lending a helping hand, and to the Morley Observer for taking this photo.